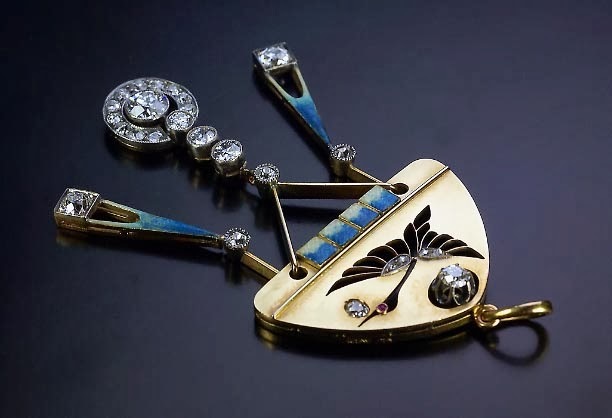 For this Fabergé Friday I have a very pretty pendant for you, made in the Neo-Russian stye by assay master Ivan Lebedkin, sometime between the years 1899 and 1908! The pendant consists of a triangular gold plaque, which resembles a kokoshnik - a traditional Russian headdress worn by girls and women. On the plaque is an openwork stork, decorated with rose-cut diamonds and a ruby eye. In it's mouth it carries a diamond, which might symbolize childbirth. The lower border is set with four appliques engraved with diagonal lines, and covered in translucent blue and golden enamel. 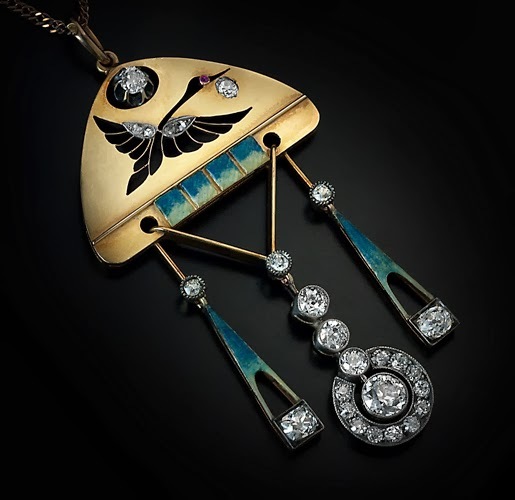 Underneath the triangle hangs two side drops, that imitate Old-Slavonic kolts (pendants attached to a female headdress), decorated with diamonds and aquamarine blue enamel with golden shades. Between these hangs a flexible bigger drop with bezel-set diamonds. The height of the pendant is 2.8'' (7 cm), and it is for sale at Romanov Russia for 35,000 USD.